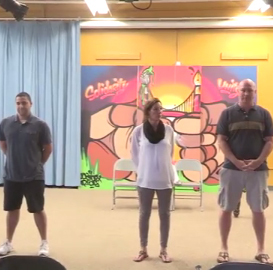 Summer Institute 2015: Watch the Videos! We just completed our 6th 3-day Institute in collaboration with the University of San Francisco School of Education at Balboa High School in San Francisco, and we’d like to share with you the Culminating Presentation that took place on Day 3 of the Institute. Here are videos of the Introduction to the Presentation, the Presentation itself, and the Q & A session that followed. Scene 1: What does it mean to have the right to an education, as a teacher and as a student? Scene 2: How are your rights connected to your responsibilities? Scene 3: What does a human rights culture look like?